Cosmetic Industry Buyers & Suppliers (CIBS) celebrated its 70th Members Only Luncheon on Nov. 8 at the Harvard Club in New York City. Along with the networking festivities, the membership approved the suite of 2018 officers. Current president Myoschi Oriol addressed the membership and updated the group on the year and thanked them for their support. Incoming president Benny Calderone accepted the position and briefly spoke about his plans for 2018. For the year ahead, officers include: Benny Calderone, president; Jenifer Brady, vice president; Judy Vincenty, treasurer; Balla Murillo, recording secretary; Allyson Tobin, corresponding secretary. 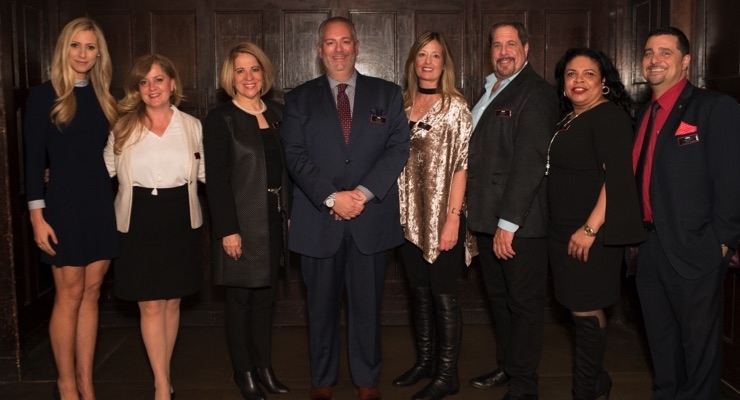 Pictured: 2018 CIBS officers and members (L-R): Allyson Tobin, Disc Graphics; Balla Murillo, Hampden Paper; Judy Vincenty, Millennium3 Packaging Group; Benny Calderone, HCP Packaging; Jenifer Brady, Brad-Pak; Charles Marchese, ABA Packaging Corporation; Myoschi T. Oriol, Estee Lauder Companies, Inc.; Nick LoPrinzi, Color Carton. Photo courtesy of Beauty Packaging.